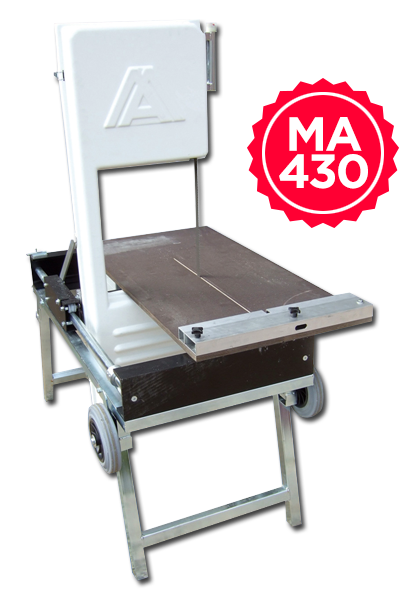 The portable band saw MA 430 – Fully portable and build to withstand the most demanding environments. The MA 430 block saw provides a very accurate clean cut which is essential for thin joint building sysrems. The MA 430 is an incredibly tough and hard working portable saw. Mounted on for locking castors, this light-weight and easy-to-use machine is compact enough to fit trough a standart doorway and is big enough to cut the largest production block. Perfect – This saw „comes“ with you to work! The block saw MA 430 – transportable and powerful! Robust, mobile, powerful, safe, cuts precisely and works reliable!